2018-01-19: Added Awakening and Skills sections. 2018-01-16: Reformatted tables, added more info, added story translation. 2018-01-15: Added most Special Guardians. Added Bugs section. Added mini-Walkthrough. Started Currencies/inventory section with gem list. 2018-01-11: Added several useful resources from Reddit to the Addendum. As with many Clicking games, especially one this complex, it’s hard to provide exact advice to every situation. This is my experience with the game, having spent no money on IAP. I’ll try to guide you through the major milestones and provide the most useful advice at each step. When just starting out the game can be very overwhelming, but be assured there’s not much you can do “wrong”, especially at this stage of the game. Your first goal is to get to Stage 200, which will unlock “Valhalla potion”, this game’s method of Resetting/Prestige. This is a Prestige-heavy game, meaning progress is largely about getting as far as you can, resetting, then using the resources gained by resetting to progress faster in later cycles. You should get plenty of Yggdrasil Fruit from Daily Rewards early on; you should feed every Guardian at least one, and save some for new Guardians. Early on in the game your first long-term goal will be to get all Guardians. You get a new Guardian every time you fight a new Stage Type. Stage Type changes at random every 10 Stages; every 5 Stages you’ll fight the Guardian of that Stage Type as a Boss. You likely won’t get all of them before your first Prestige, but they’re a good reason to try and keep progressing as far as you can before your first reset. If you find yourself unable to beat a stage even using your Active Skills, it’s time to reset. After your first Prestige your goal will be to make it as far as you can without the game getting unduly slow. We’re talking significant effort to pass even a single stage. Then we’re going to start farming to unlock all Servants. Servants are unlocked by beating Stage Bosses, which gets increasingly hard without a reset. So we’ll reset every 200-400 levels to keep raising our Boss KO counter. It took me about 10 resets personally. Servants are awarded at random in the “Achievements” (scroll) menu, but once you get 30 you will be guaranteed to own all of them. Once you have 30 Servants you can start going on every Exploration in the game (tap the Compass icon toward the top). Exploration gets you free “shop” items: things like MP Crystals, Mana Stone Runes, Special Summoning gauge percentage, 40% Awakening Potions (a major prize early on). Make use of your rewards and try to get all the Holy Relics you can. Once you have all Servants and a few Holy Relics with decent effects, it’s time to push as close as you can towards Stage 1000. Once you can break the 1000 mark you should be able to coast through Stage 200, and thus Prestiges, with little to no interaction. Your Servants, if fed enough Yggdrasil fruit/Awakened/reset enough, should be dealing over 100,000 DPS immediately after a Prestige and thus able to coast right through a few hundred stages. Resetting immediately after Stage 200 isn’t particularly the best way to get Morning Star Fragments however. You’ll want to go as far as you can without unduly manual play to collect Star Fragments for Holy Relics. 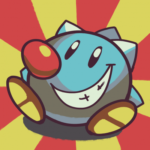 The most important relic that I’ve seen is Lutie’s Lollipop, which adds an incredible amount of per-tap damage per Lutie’s level. Reset until you get this item, and level up the cheaper levels of other Holy Relics. Lutie’s Heart Candy, Ancient Morning Star Coin, and Ancient Guardian Coin are also particularly valuable. After a certain point the game’s story is no longer translated. Here is a machine translated version, or read it here. 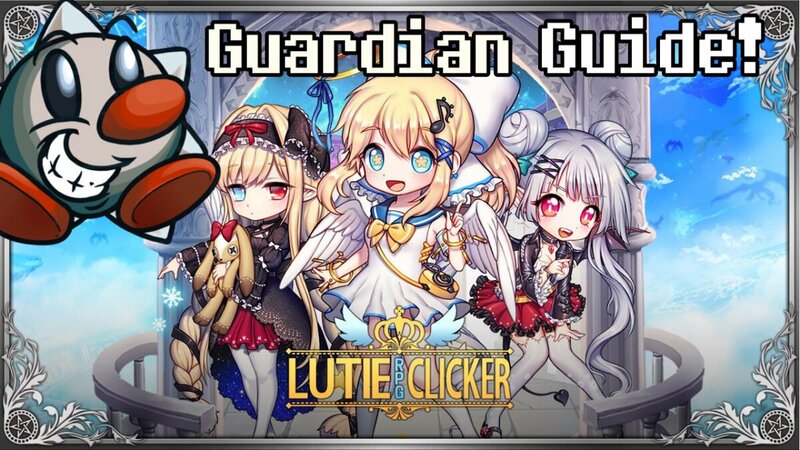 Guardians are your passive DPS source in Lutie RPG Clicker, and they’re very important at every stage of the game. Early on they’ll provide a fun short-term goal in collecting them all, and later on they’ll be instrumental in powering through early-game enemies after Prestige/resetting the game. Perhaps most importantly, Guardians come with Skills that passively boost either Lutie’s tap damage or other Guardians. Since it’s a bit hard to keep track of who has what skill I made this guide. Here’s a table with all normal Guardians in the game. Search for which skill you want to upgrade to find which Guardians to look for. I personally find Lutie’s Scepter and Soul Stone to be the most effective upgrades at almost any price. The default sort for this table is the “house” icon sort in the Guardians tab. Note your 3 “Crew” Guardians will still show at the top of this sort ingame. Coming soon, but Lutie RPG Clicker describes most skills fairly well in the game anyway. In the Game Controller icon on the left you’ll find the Awakening Gauge. You can also convert bits of Awakening energy to Yggdrasil Fruit here, but shouldn’t do so unless you’ve run out of characters to Awaken. Gauge is very valuable. The “level” of the Valhalla potion doesn’t actually mean much; it’s actually just a counter that shows how many times you’ve reset. It also changes the border around Lutie’s picture. If you dawdle on a Stage without challenging the boss occasionally Reaper Nazar, a pale woman in a blue dress with a scythe, will replace an enemy some percentage of the time. Nazar appears whenever your DPS exceeds 50% of the stage enemy’s HP and is an encouragement to keep advancing through stages. The icon of an eye with horns in the top left will light up in blue when the conditions to cause her are met. Every 100 Lutie levels, you’ll unlock a new Skill. These are particularly useful (and often necessary) to beat the Bosses at the end of Stages, especially the Guardian bosses every 5 stages. Lutie RPG Clicker appears to rather strictly prohibit the use of autoclick macros due to the competitive leaderboards. If you get a message about being “under 1st regulation” restrictions when logging in, the developers have identified possible autoclick macro behavior on your account. It’s unclear exactly how this is identified, but it’s likely repetitive or inhumanly fast actions. Merely using Nox App Player does not appear to trigger the soft-ban by itself, but it’s macros easily can. If under a first level ban you won’t be listed in Raid leaderboards, and you can appeal in the options menu if you like. If the developers decide to mark your account for a “2nd regulation” it’s a full account permanent ban, so best to not continue whatever resulted in the initial ban. It’s unclear (but unlikely) if appeals are paid attention to for Second Regulation bans. As in many mobile clicker games, once in a while a Gold Star will float about at the top of the screen offering a bonus in exchange for watching an ad. These give you a small but steady amount of Awakening Gauge and Rubies to power up Lutie and her Guardians. After 20 Gold Star ads have been watched you’ll get Silver Stars which 20x the current per-monster coin amount. Silver Stars still count towards the “star rewards” achievements and are a really great extra source of income if you can catch (and bear to watch) 20 ads early enough in a day. The “Novice Daily Reward” calendar currently instead shows a repeat of the regular daily reward. However it seems you still get the Novice Reward for that day regardless. When switching devices without logging out of the first device, the game will say “connection environment changed, please restart the game”. You’ll basically have to start the game twice (and tap log in, but not have to re-enter your password) every time you save and swap devices. This can be avoided by logging out before starting on the second device. More of an oversight, but the tutorials ingame show up in Korean regardless of the language set. Some later Story elements and Seasonal Event info are also only in Korean. The devs have stated that this likely won’t change soon unfortunately. Lutie RPG Clicker has a rather dizzying quantities of currencies/consumables. Runes upgrade Mana Stone damage by 1-10%. Rune effects will be lost if the Mana Stone is lost, so keep them for Legendary Mana Stones or the mana stones on your Guardian Crew that will be preserved through resets. Runes can be bought with most uncommon currencies (gems etc), but are somewhat plentiful from Exploration. I would recommend waiting on Exploration before blowing currency on them. Pisces Runes add a random multiplier to your Mana Stone from 1 to 10% (10% is marked with an M for Mastery). You can re-engrave a Mana Stone if you want to try for a higher percentage, but note you may get a lower percentage too. Unless you’re rerolling until you get an M, I would stop once you hit 5% or above, since you’ll more likely lose effect than gain it upon a reroll. Taurus Runes are a simple +1% to your Mana Stone’s multiplier. It will not exceed 10 (M). Taurus Runes are much rarer. Silver (platinum?) Coins are only earned by completing Mini-Games in Lutie RPG Clicker. Mini-Games are accessed through the Game Controller icon on the left of the main screen. You can only play each game 3 times for free each day (2 extra times with rubies), and only earn around 50 coins on average per game, so some of the skins that cost 10,000 Coins can be a fair bit of a grind. Costumes in the Coin Shop can be bought for Sapphires instead, but Sapphires are best spent on Transcending/Awakening Servants. Unfortunately neither Mini-Game is very colorblind friendly. Gemstone Mine is an extremely large (and hard) Match 2 memory game. A huge grid is filled with 2 of each type of Mana Stone design/color and you have to tap the tiles to reveal them. The last 2 tiles tapped will be visible, and tapping two identically matching gems in sequence will add 1 to your score. Each 1 match is worth 10 Silver Coins. Since the game is so hard and so unpredictable, a quick method is to simply tap along the entire bored in sequence, going row by row or column by column one tile at a time. You can fairly reliably get 2-5 matches this way, which matches or exceeds my average intentional play score for drastically less effort and frustration. Once you’ve tapped every tile column-wise, start tapping them all in row order (or vice versa). Three random panels will hold Reaper Nazar, who will reduce your time by 10 seconds if you tap on her, you can’t meaningfully do much to avoid her. The only thing you can do is try to avoid tapping extra panels, but unless you’re really good at the same I would recommend the above blind method. Gemstone Catch is much easier than Gemstone Mine and easy to get a more consistent score. You’ll search a smallish grid of gemstones and tap the gem that matches the one at the top of the screen. Each score/gem is worth 2 Silver Coins. The difficulty here is Ilenoar, who prances around the top of the screen. As long as she’s running along you can freely collect gems, but once in a while (totally random, best I can tell) she’ll pop up from the bottom of the frame with a devilish grin. If you collect a gem while she’s in this animation, she’ll steal it and subtract 10 points from your score. She will still subtract from your score even when she’s crying and starting to leave the frame. Be patient, since a single stolen gem removes a great amount of score; it’s pretty much never worth the risk of her stealing a gem, so wait to confirm she’s not going to steal from you. There is also one Ilenoar tile per board which will subtract 10 from your score as well. Just don’t tap it, it’s very easy to avoid. There’s three kinds of gems, each earned in different ways and used in different manners. Rubies are the standard mobile game “gems/diamonds” in Lutie RPG Clicker; the basic Premium Currency that buys short-term boosts and permanent unlocks. You’ll earn a large amount of them from Daily Rewards, Achievements, and by watching Ads. Early Rubies are best spent getting a good Secret Vault (tap the G bag icon at the top of the screen) set up and getting Novice DPS/Tap scrolls in the Lutie menu to speed through the first 500 stages when it’s helpful. Emeralds are only earned by participating in Seasonal Raids, which occur every few weeks. Access Raids in the Game Controller icon on the left of the screen. You’ll get 1,000 for completing the Raid Season Click Reward goal, which should be easy as long as you can get about 600+ taps per day. You also get 10 Rubies for the first raid every day. Emeralds are primarily used to unlock Season Costumes for Guardians; most cost 2,000 Emeralds, which is what you’ll get for playing a Raid enough days. You can also buy High Quality Summon Potion, and Legendary/High Quality Manastone Chests. I recommend saving them for the costumes (and the DPS bonuses they give) as they’re otherwise impossible to get. Sapphires are only earned by participating in the Servant Raid in Lutie RPG Clicker, which is accessible when it isn’t a Seasonal Raid. You get 1000 Sapphires for completing the 300 Taps goal for each “Free Season” servant raid. You can do that in as little as 3 days with perfect tapping as 100 tap targets show each raid. Sapphires also let you buy Yggdrasil Seeds to Awaken Servants, Baldr Potions to Transcend Servants, Costumes (these are all availible for mini game coins instead too) and Runes to enhance Mana Stones. There’s other ways to get Mana Runes and the costumes, so Yggdrasil Seeds and Baldur Potions are what you should buy here. Baldur Potions are particularly valuable as they’re the only way to Transcend servants, while Awakening servants can be done with Awakening Gauge as well. Like Emeralds, it’s worth spending 50+ Rubies to re-try a raid if it means you’ll hit the Raid Season Click Reward bonus, assuming you wouldn’t reach it without spending rubies. Lutie RPG Supporter: Puzzle, a puzzle game from the same developers, based on collecting the art from the game. Thanks to the /r/Lutieclicker community for answering my questions! Thanks to Marcelo Tabacnik in the comments for corrections and Special Guardian stats!